IHS forecasts Wireless technologies like Bluetooth and embedded cellular in cars are set to rise by 41 percent from 2012 through 2018. 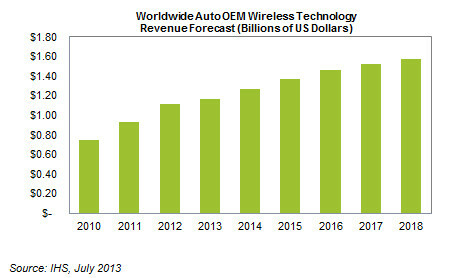 Global original equipment manufacturer (OEM) market revenue for wireless technology in cars is set to rise to $1.6 billion in 2018, up from $1.1 billion in 2012, as presented in the figure below. Revenue for wireless solutions in cars will reach a projected $1.17 billion this year, up a respectable 5 percent from 2011. While growth this year has moderated from the sizable double-digit increases of 2011 and 2012, continued expansion is assured in the years ahead. Expansions in the 8 percent range are expected during both 2014 and 2015. Bluetooth will remain the standard wireless connection between consumer devices and the infotainment stack unit of a vehicle for the foreseeable future. The next generation of Bluetooth, or 4.0, will offer higher transfer speeds with the high speed (HS) option, while ensuring that gadgets stay paired longer and take up less power. Data transfers taking place, however, will not be carried over the Bluetooth link itself but via a collocated 802.11 link through a competitive wireless technology—in this case, Wi-Fi. It remains unclear if OEMs will prefer a decoupled solution for Bluetooth and Wi-Fi in cars, or if they will opt instead for a combo approach that optimizes cost and reduces the design workload. A separate chip approach is likely in the short term because of the still limited pull of Wi-Fi in automotive, IHS believes, even though the broader diffusion of wireless technologies points to integrated combo solutions being used in the future. An approach in which the antenna box is mounted on car roofs could allow savings for vehicle manufacturers of up to $30 because the use of coaxial cables would be reduced—illustrating how a specific solution can have a direct bearing on overall costs.